1、Project Construction Company：Sino-Aus Dubbo Donghai Agricultural and Livestock Development co Ltd.
2、Project Funding Sources：Aus-Sino Trade Alliance Pty Ltd，Jiangsu Fu Ru Dong Hai Development Group，Jiangsu Huipu Logistic Ltd.
3、The Contents of the Project：Investment on construction of Abattoir, feed lot and the related cold-chain logistics facilities and grass cultivated. 4、Project Location and Size：The project is located at 70km far from the Lianyungang port, with the total land size of 516 acres. 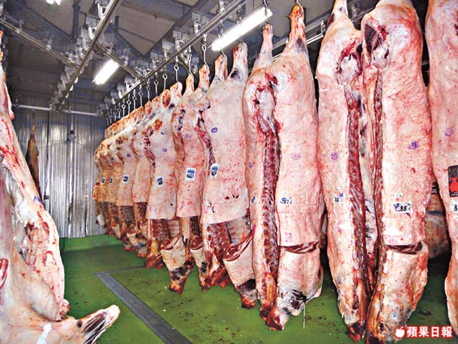 One of abattoir is 200 acres, located in Shihu Village and south of highway 323. Another one is quarantine farm, with the size of 316 acres, located in Quyang Village which is 5km far away from the slaughterhouse. Project location is satisfied with the requirements and standards of AQSIQ. On 20th December 2015, the China-Australia Free Trade Agreement came into effect with the signing between Australian Trade and Investment Minister Andrew Robb and Chinese Commerce Minister Gao Hucheng. The agreement removes many tariffs on agricultural exports from Australia to China, and specifically, implements the elimination of tariffs on beef imports (currently ranging from 12% to 25%) completely by 1 January 2024. An agreement was also made to export up to 1 million live cattle from Australia to China annually. China has historically only allowed the import of select dairy and breeder cattle, but the changes along with the tariff reductions now make it economical to import slaughter ready Australian cattle. Following this historic agreement and under the leadership of Aus-Sino Trade Alliance, Sino-Aus Dubbo Donghai Agricultural and Livestock Development Pty Ltd was established in Jiangsu, China. Taking full advantage of live cattle directly sourced from Australia and its location in Jiangsu, Sino-Aus Dubbo is the gateway for the distribution of fresh Australian beef products in China. The availability of fresh Australian beef and products to the massive markets of Shanghai, Beijing, Nanjing and coastal Eastern China has the opportunity to develop a new market for beef products built on the reputation of quality Australian beef in China. China’s demand for red meat has grown tremendously both in quantity and quality over the past decade with a total beef consumption reaching over 7.21 million tonnes in 2015. This number is expected to increase to around 8 million tonnes in 2020. In addition, the growing numbers and wealth of middle class consumers in China have also dictated the growing demand for safe and quality food, where greater trust is placed in Australian beef and rural agricultural products. The majority of Australian beef currently consumed in China is derived from frozen sources. Many types of offal are not available for direct import into China. The local market is looking for an opportunity to experience “quality” fresh Australian beef as the market perceives there is a taste advantage of fresh chilled beef vs the frozen equivalent. Product appearance also plays a major role in product selection and it is considered that the fresh product has a better visual appearance when compared to frozen product. This demand, however, was not being met by China’s local beef supply. The contributing factors include: land and budget constraints, high risk, lengthy process, and supply chain issues, causing a shortage on local beef supply and China’s beef and cattle industry to grow relatively slow and steadily decline yearly. Chinese abattoirs are also struggling to maintain trained staff through slowdowns, which results in variable product being delivered against product specifications. As a result, this led to the booming growth in the imported beef industry within a short time frame – between 2004-2014, China’s yearly beef imports grew an astounding 33.9%. In particular, 2014 saw astronomical growth in China’s beef imports sourced from Australia and New Zealand. Australian beef cattle’s competitive advantage lies in the areas of quality, variety, taste, industry and product integrity, consistency and safety – which is why it is favoured by many Chinese consumers, it is also why there are so many record-breaking figures in the Australia-China beef and cattle export/import trade. We are strongly committed to responding to our customer’s needs and providing our customers with the highest quality of live cattle and beef products, and our direct and complete control over our supply chain enables us to do so in cattle trade for quality Australian beef cattle.